Add a price guide to help further qualify your leads. 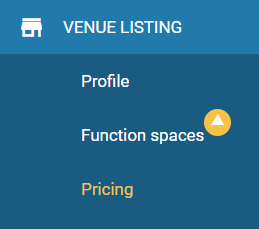 The food and beverage price guide in Venuemob Manager allows venues to indicate to customers what the starting price of individual plates, set course menus, and drinks are at your venue. Basically, it allows customers to get an idea – at a glance – of how far a bar tab will go, and if their budget is adequate. Using the data provided by you, the customer can adjust the portion of their budget to cover drinks and/or food. This gives venues a clearer indication of how the customer wants to structure their spend, and customers a clearer understanding of how much their event is likely to cost. Only customers planning a social event (birthday, engagement party, etc) will see this price guide. Head to Venuemob Manager > Venue listing > Pricing > . You'll find the Price guide below the Minimum spend and hire fee section. Enter a package per person starting price, or a per-main dish starting price. In this example, we'll go with a package price – e.g: the two course set menu is $30 per head. Then press 'link to menu'. This links to a menu/pdf already uploaded to your listing. Don't forget to press save! Click the toggle icon to the right side of the drink bar to turn it on live. For drinks, the prices are divided into beer, wine and spirits. This feature will be most useful for those arranging a bar tab, so we recommend you enter the starting price per item. You can turn on/off each item, depending on what you offer. For example, if your venue doesn't offer spirits as part of a bar tab, you could turn off spirits, as we have done in the example below. You can adjust, remove and amend these price guides at any time.